All the latest Breath of Fire cheats snes cheats, game genie and action replay codes for Breath of Fire cheats on the SNES are here in this article. 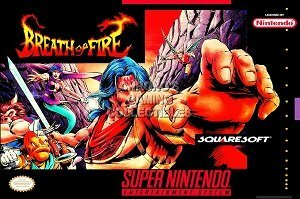 The Breath of Fire game on the SNES / Super Nintendo is a very challenging game and can be quite frustrating at times, Hopefully using the below cheats and codes will help you to beat this game. If you use these cheats or know of any cheats or codes I have left out please let me know about it by posting a comment below. HARD TO FIND BOW – On the same dungeon floor you face the Wasp Boss in Aqua, search the right wall. Behind a pillar you’ll find a secret spot. Hit A or B, and you will find a Steel Bow for Bo. EMPEROR SWORD – After you defeat Jade in Scande, walk up to the chair directly behind him and go behind the chair and press A. You will recieve the Emperor sword which is the most potent sword in the game for the hero. AGNI DRAGON – Go to the well that is surrounded by mountains and use Rod 4 to fish there. Your character will discover a tablet that reads “In the mystical waters, the great power sleeps.” This message refers to the water that was used in the town with all the dead people. Return to the cave where you got that water and decend to the bottom of the cave. There you’ll find a dead end filled with water. With the tablet in your inventory, walk out into the water and you’ll discover a hidden cave. Therein lies the Agni Dragon. PLAYING TIP – When you get to Jade tell him that you want to join him and then just sit there. After a while he will say you’re boring and have you fight a monster. The monsters start out weak, but he will send stronger one’s the longer you wait. He goes through two lines of enemies and will not stop until you try to do something. Then he’ll ask if you changed your mind. If you say “yes” then you will go into battle. This is a very good way to level up right before the big battle. There are a few things you can unlock in Breath of Fire cheats they are listed below. If you are lucky enough to own an action replay you can use the below codes in Breath of Fire cheats on the SNES. If any of the codes do not work, or if you know of any that do work that I did not mention please post about it in a comment below. 7E549F:FF – All warp locations are added to the list. 7E1036:FF – Arrow movement tiles dont work. If you are lucky enough to own a Game Genie you can use the below codes in Breath of Fire cheats on the SNES. If any of the codes do not work, or if you know of any that do work that I did not mention please post about it in a comment below. If you are playing Breath of Fire on Snes9x (Or another SNES emulator which supports cheat codes) there are a ton of cheat codes you can use. You can basically use any of the codes listed under the Action replay codes + Game Genie Codes sections, you simply need to enter the required code as per below. Question : Can I use all of these Breath of Fire cheats SNES Cheats? Answer : The cheats I have listed under “Normal Breath of Fire cheats (SNES) Cheats” can be used by everyone. You will need a Action Replay or Game Genie to use the cheats listed on this page. Question : Do the Breath of Fire cheats Cheat Codes Only Work In The Snes9x Emulator? Question : I know a good cheat for Breath of Fire cheats that is no listed on this page, Can you add it. Question : Do you have any gameshark pro codes for Breath of Fire cheats? I hope this article on Breath of Fire cheats (SNES) Cheats + Action Replay | Game Genie Codes has helped you. If you are aware of any tips I have missed off please post about them in a comment below. Please help us out by spreading the word and sharing this article on Breath of Fire cheats (SNES) Cheats + Action Replay below.